John, one of Swoop’s polar specialists, recounts one of his favourite things to do whilst exploring his favourite continent: polar plunging. Polar plunges are quite literally the coolest thing you can do in Antarctica. On my last voyage 48 out of 92 people jumped into the icy water; that’s quite a lot. I’m going to take some credit for that enthusiasm. I was ready for the jump well ahead of time, walking around the lounge of the Sea Adventurer in my base layers, pumped up and ready to jump. “Yeah, I’m jumping…” I said, “…you’re not?” People disappeared and reappeared in towels; the game was afoot. Polar plunges are activities you will probably only want to do once, so you’re going to want to get it right first time. 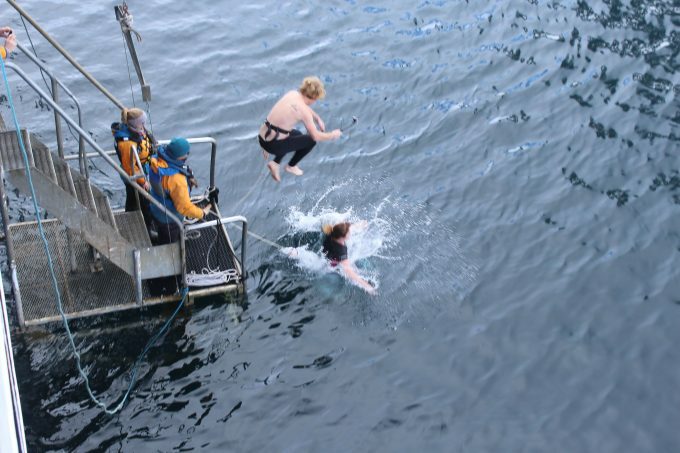 If you are unfamiliar with a polar plunge, it’s simply a person, possibly you, standing on the edge of the vessel and jumping into the very cold polar water. You don’t jump far, and you are probably in the water no more than a billionth of a second. You are tied to the vessel with a safety harness, so you won’t sink, and if you do, someone is there to pull you out. To my knowledge no one ever needed it, but there is always a doctor on board, just in case your toes drop off. So, unless you are absolutely petrified about the cold water, try not to just step off the platform. I watched a Canadian guy jump like a star fish, not so special, until you saw the photo after. He was holding out seven fingers: five on one hand and two on the other; an obvious nod to his seventh continent. Very cool. Personally I did a bomb, which in my mind was fearless. What I got was a huge splash and a great photo, but not a contextual photo. Almost every single photo I looked at afterwards was just of a person jumping into water; nothing else, just the platform, the jump and the water. What was needed were icebergs or snow. So whoever you’re asking to film or take photos of you jumping, get them to include some ice. Pan in from the glaciers behind, or take a wide-angle photo. When you get home, you will really appreciate this. Get ready early and be at the front of the line: waiting 15 minutes to do a polar plunge, wearing just swimwear and a towel, is literally torture. GoPros should be firmly secured to your body or strapped around your wrist; the shock of the cold water will make you drop it – that’s why there are so many GoPros at the bottom of the sea! If you are jumping with a GoPro, then think about jumping backwards – the ice should be in frame then, and not the side of the boat. Also, keep your film rolling, you will really appreciate the two minute build up to your jump, and the minute or so after you did it. It’s great fun – that I can promise you. If you are on the fence about whether to plunge, I can tell you that of the 48 people (of 92) on my last voyage who jumped, zero regretted it. And only the crazy Canadian wanted to do it again! So, take my advice: if your voyage offers a polar plunge, prepare and jump. It’s the coolest activity in Antarctica. John first left the UK, aged 20, on a flight to South Africa. He eventually found his way to Finland, where he became a fisherman and spent 13 years living under the northern lights, just south of the Arctic Circle. John's most memorable moments include swimming with crocs in the Congo River, climbing Kilimanjaro, horse riding in Afghanistan and kayaking with humpbacks in Antarctica. John has visited all seven continents, and to date he has visited 154 of the 193 UN countries in the world. John loves nothing more than to talk all day long about the polar regions, his favourite parts of our planet.